Now you can use Atom and Pinegrow together: code parts that are easier to code in Atom and use Pinegrow's powerful tools to work with HTML structure, Bootstrap, WordPress, master pages, components and so on. Use Ctrl+Alt+P in Atom to select the current element in Pinegrow. Open and refresh the current page in Pinegrow. Atom and Pinegrow can run on different computers with different operating systems. Read instructions below on how to map local and remote file paths. Live sync works for HTML (or other types that are listed among editable types in Pinegrow's settings) and CSS files. Download and install Pinegrow and Atom. In Atom go to Preferences -> Install and install pinegrow-atom package. In Atom go to pinegrow-atom settings and set the URL of the Pinegrow instance you wish to connect to. Note that every Pinegrow window has a separate API URL. Use Support -> Show API url in Pinegrow to get the correct address. Atom and Pinegrow will sync edits for HTML and CSS files open in both editors. Use Support -> Settings -> Editable types to tell Pinegrow which file types should be handled as HTML files. When running Atom and Pinegrow on different computers file paths will probably not be the same in both apps. Most likely you'll open local folder in one app and a network share in another app. 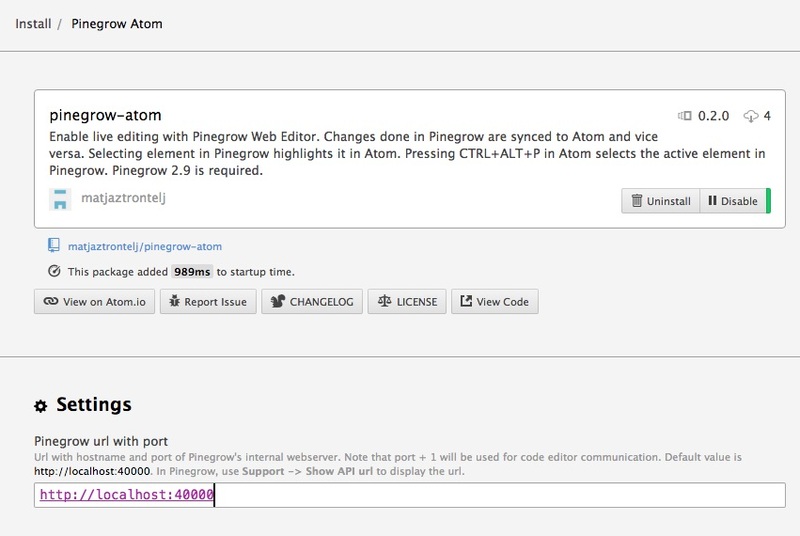 In Atom use Packages -> Pinegrow -> Detect PG <-> Atom file path mapping to auto-detect the correct path mapping. Also, you'll have to replace "localhost" in Pinegrow API url with the name or IP of the computer where Pinegrow is running. We plan to add support for VCE, Brackets, SublimeText, Dreamweaver and others. Signup to our newsletter to stay in the loop. Your country's VAT will be added to the price (sorry, nothing we can do about that - at least the tax money goes back to your country). If you're registered for VAT you can make a VAT-free purchase by entering your VAT ID (in form AA 999...999) during the checkout. There is a "Add VAT number" button at the bottom of the payment mode selection screen.